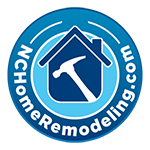 At NCHomeRemodeling.com we work to restore great homes throughout the Raleigh area, whether they’re modern, or even historic. We have experience with all eras and styles of homes that North Carolina has to offer. This homeowner saw the beauty and potential in this 100 year old farmhouse and she asked us to make her vision a reality, while trusting us to take care of the quality and lasting durability of her home. The kitchen was dysfunctional, lacked space and character, but their was also so much potential to work with. We started by adjusting the footprint of the room to accommodate a new layout. The window wall of the kitchen was crowded and lacked cabinet space. The windows were replaced, raised, and the sink moved to the window wall. The refrigerator is moved to the opposite side of the room. Cabinets were added to flank the window wall. The old stove is moved to the opposite side of the room, near the pantry. The pantry was dark and crowded. We started by removing the water heater and installing an exterior tankless unit. The old base cabinets were removed and new base and wall cabinets installed. The doorway is raised and widened slightly to give the space an open feeling. Finally, old linoleum is removed to reveal beautiful wood floors. The floors are stripped and prepped for refinishing. The primary doorway to the kitchen is rebuilt to make the entry larger and more inviting. Tile backsplash, granite countertop, and statement lighting are added. The end result is a beautiful kitchen that is both functional and open, ready for dinner parties! Call us for a quote, or contact us right here on our site on our contact page form, we work throughout Raleigh and the Wake County and Triangle areas. No Replies to "See Our Work: 100-year-old Farmhouse Kitchen Remodel"